After my last article on the Swan 65 which was a bit of a mixed feeling on the yacht, here´s a new one on a true revelation. I mean it: The Wauquiez Pilot Saloon 42 is one of the two boats of this year´s Duesseldorf boat show which was really taking my breath and took me away. This boat – although not a really new boat nor a premiere – was catching my imagination immediately. What a great yacht! She was a revelation of what is possible for a cruising yacht in 42 feet! She was designed by renown French bureau Berret-Racoupeau back in the last year and is targeting the owner-couple going on a long voyage. 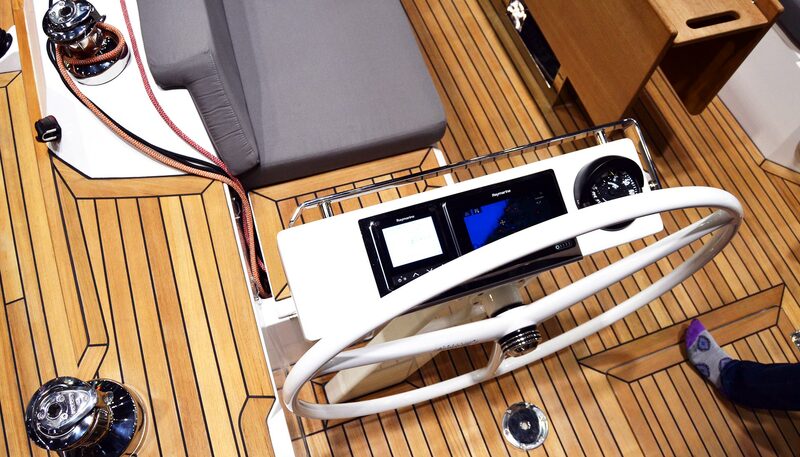 Although the boat is available with two aft cabins in a 3-cabin-version, the shown layout with two cabins is, from my point of view, the desirable layout for a boat like this. This is what a pilot saloon should be looking like! At first, standing outside of the boat, one notices instantaneously that the coach roof of the Wauquiez Pilot Saloon 42 is indeed huge. The yacht is by no means sleek or “thin”, she reminds me of a sportscar with her elegant superstructure. Berret/Racoupeau have done a great job in giving her voluminous hull shape a stylish, fast appearance. The windows in the hull and some other design elements can conceal pretty good the otherwise not-so-sleek lines. But why this “sleekness” doesn’t really matter is understood instantly upon entering the salon: I promise, I´ve never ever stood in a salon of a sailing yacht that big! 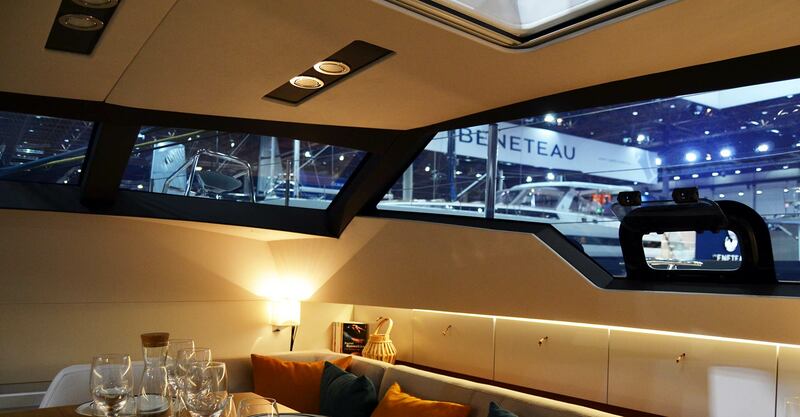 The raised salon is light suffused and offers full standing height with sufficient headroom to the roofing at every single point of the boat. The huge windscreen and side windows of the coach roof make for an almost full 360 degree panoramic view. Entering the salon – look at this almost 360 panoramic view! I almost felt like being aboard an Oyster because this level of light and view through the coach roof is up until now something I haven´t seen anywhere else than on the English boats. The Wauquiez is bristling with light – as I was taking the step to have a seat at the nicely done massive dinner table on the raised level I was excited imagining mooring now at a quiet anchorage and enjoying this view, just marvellous! A nice raised dining area. Look at the fantastic table design. The whole feel of the boat was … just perfect. The Wauquiez is a modern styled yacht with loads of modern elements but I never felt displaced or kind of disconnected. Everything makes sense and the level of modernity is never too extreme. The Wauquiez is French design and French taste at it´s best I would say – I felt at home and could envision myself going ´round in this yacht instantly. And this is what the boat is made for: The long haul trip for a couple, maybe occasionally having some friends aboard or a kid or two. In this, the yacht is equipped just fine. Best example is the large galley that is placed perfectly at port side. 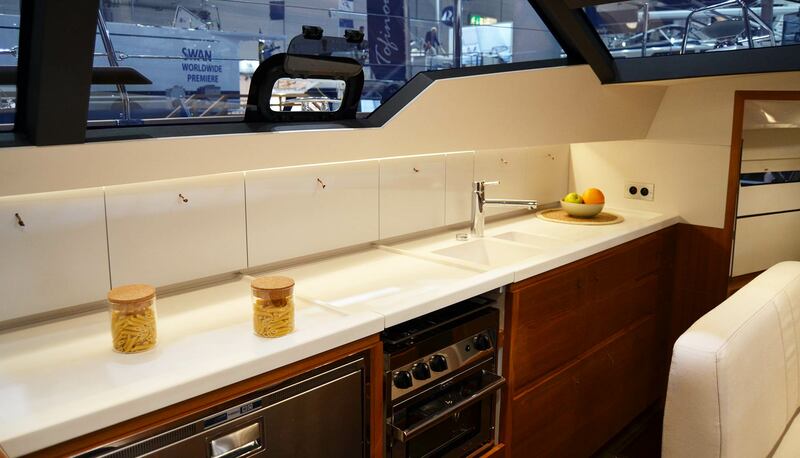 The galley is longitudinally shaped and offers a worktop almost as long as the whole salon. Longitudinal galley that leaves no wishes unfulfilled. 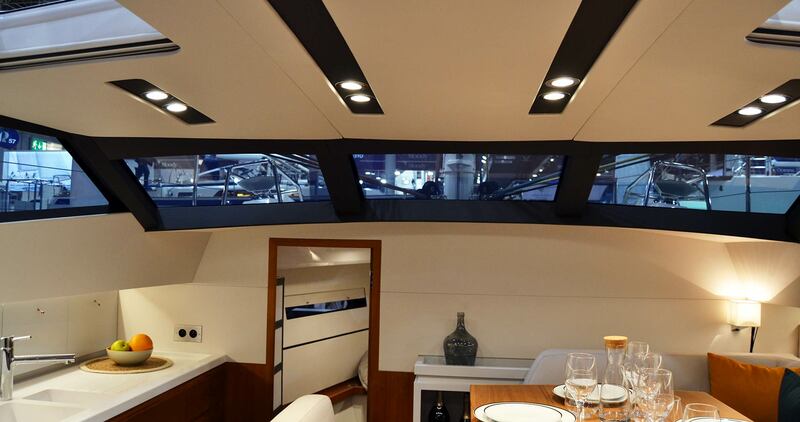 The walkway between galley and the raised dining area (where lots of stowage is placed) can be used to wedge oneself into when seas are going rough. I loved the Force 10 stove which boasted some nice features like the one-hand movement unlocking of the gimbal. 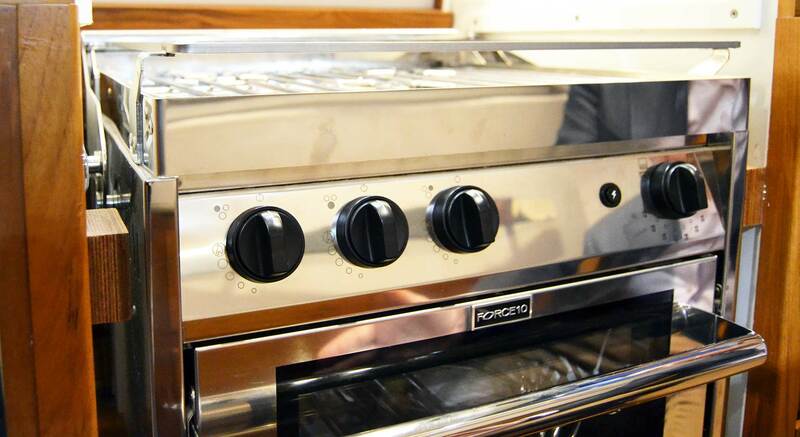 Also the nice proprietary stove door that opens to the oven is great: The whole door will slide underneath the stove, so no knee-tupping anymore. I just love the Force 10 stoves! Yepp, there is no chart table anymore but I find this more than consistent: In almost every production boats to date and even in the high-level yachts (like the Swan 65) I witness the slow demise of the classic chart table, but it seems none of those yards wants to go the last step – getting rid of them. They are placing them at spots where no skipper would walk to even if he wants to navigate by paper charts, tables decreasing their sizes to hilariously small desks or hidden somewhere as to provide an alibi. Well done, Wauquiez, skip them completely! The skipper of the Pilot Saloon 42 will eventually sit down at the beautiful dining table and have his chartwork done here. Basta! Another point on long cruises is temperature. Of course can the Wauquiez be equipped with latest technology in air conditioning and generators, but there is an even better mechanism built in to prevent the salon from overheating in sunny latitudes – dimmable windows. The windows in the Wauquiez Pilot Salon 42 can be dimmed stepless by pushing a simple button. The whole process involves low current voltage (which won´t affect battery levels too much) and the full-glass windows. It takes no less than 5 or 8 seconds to have the windows dimmed from a clear white-blueish colour to a very dark-blue tone that will effectively block UV and heat from the shining sun. Apart from this, there are numerous openable windows and portholes and a number of skylights in the roofing. Again, the Wauquiez delivers a solution that is cruise-ready and adequate for everyday´s use on a cruise. All too often yards come up with fancy ideas which prove too far away, but the Wauquiez is in my eyes a boat well suited for a very long trip under sails. Which brings us to the cabins. Again, the Wauquiez delivers full range. 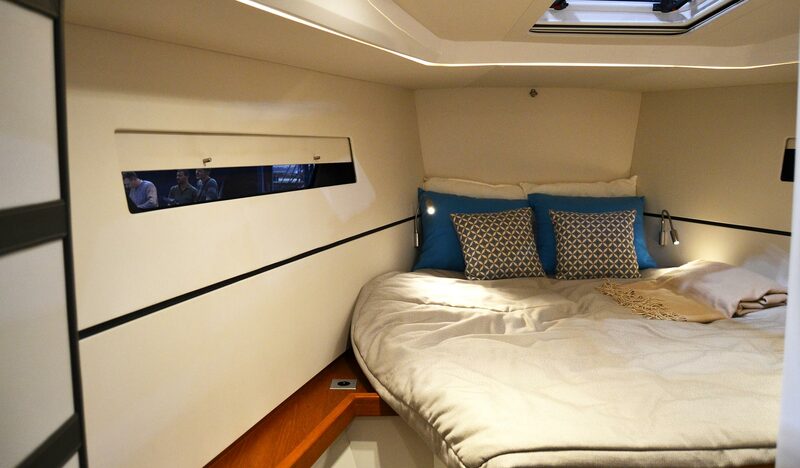 The boat offers a huge aft cabin for the owners. 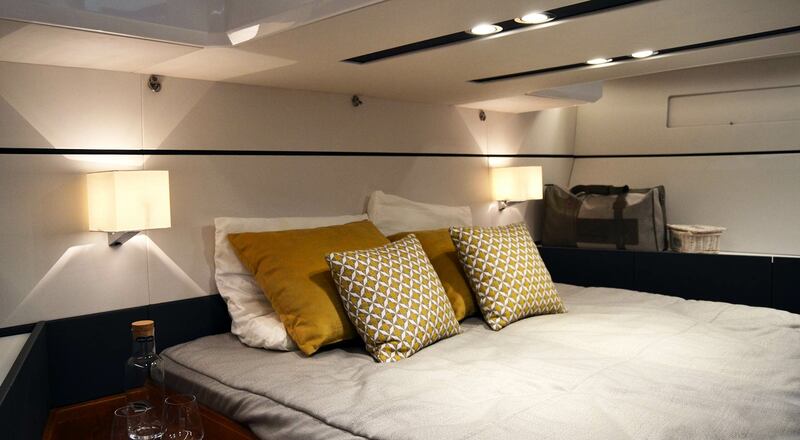 The cabin may be entered via port side entry and offers a King-sized island bed in the middle. Two nice windows in the hull will provide for natural light, although to my taste the windows could have been placed a little but more down to the waterline to offer a nice view over the Ocean whilst in bed. But maybe that´s due to some CE-regulations which I don´t know. What an incredibly huge aft cabin! The salon is very wide, almost the full max beam of the boat. 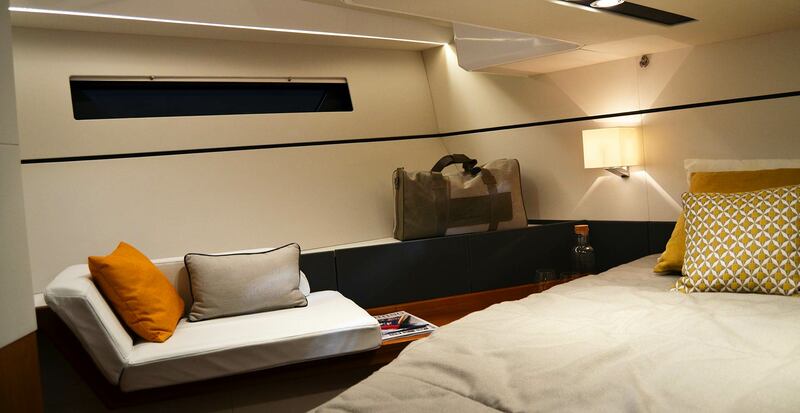 In this, there is so much room for stowage and lockers and even – which I liked the most – a small chaise longue on starboard side which was interestingly enough facing rear. Was it for the camera man? I don´t know, but most certainly very cozy for reading a book. I loved the small chaise longue. 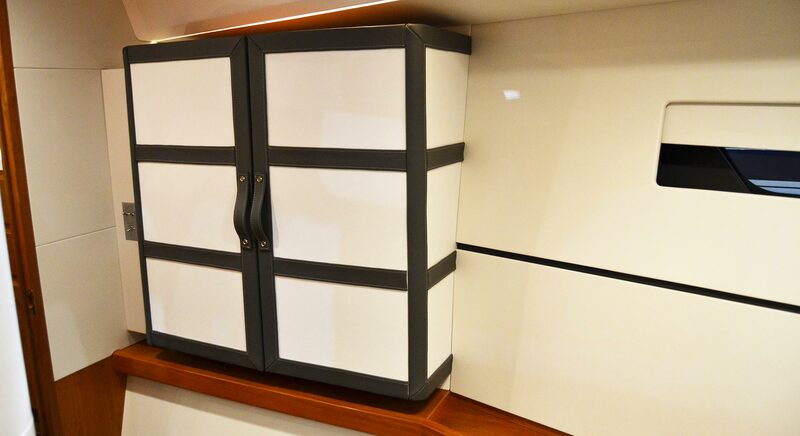 As I mentioned before, the Wauquiez PS 42 is also available in a three cabin layout which would then offer a smaller aft bathroom for the sake of the entrance door to the third cabin. But I would strongly advice not to go for this layout as the 2-cab-version is just perfect for an owner´s couple. The fore cabin of course will remain the same no matter which layout one chooses. A bit “cold” but again huge: The fore cabin. Although I must say that in this cabin there is too much plain white panelling for my taste (a little touch of wooden surface or another colour here and there would do just fine) I must say that this cabin as well is a masterpiece of thoughtful interior and planning. The volume is huge, even here there is full standing height and sufficient amount of headroom. The cabin features an island bed (pre-rigged for lee-sails, very nice detail!) and again lots of stowage. 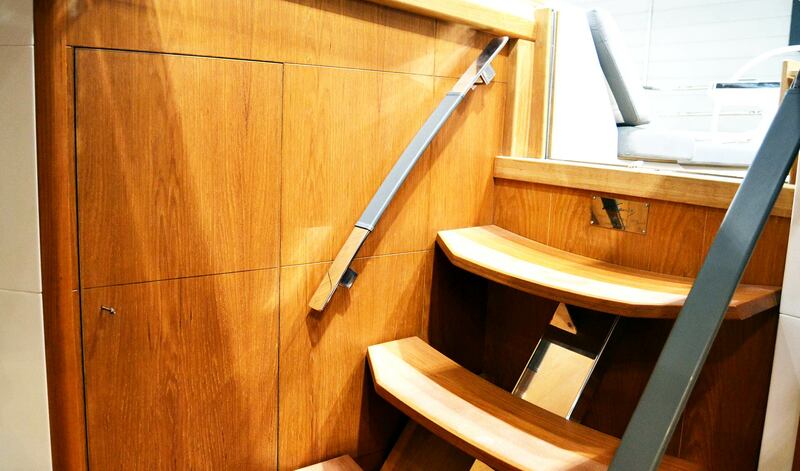 I particularly loved the hanging locker which remined me of the very same approach found in the Club Swan 50. The fore cabin also features a fully equipped bathroom, both of which by the way have a large, separated shower chamber and very nicely done interior applications. The level of finishing quality is pure bliss. Overall, the finishing quality in the Wauquiez was really appealing. The French yard does a particularly nice job with wooden surfaces, bent edges and nicely shapes here and there. It is a bliss to see rounded corners and such a level of love and dedication to details which cannot be found in production boats. I leave the perfectly done internals of the boat and climb back into the cockpit. “Climbing” is the right word as – for the sake of offering the space inside – the deck of the cockpit is to be reached by climbing over a some 50 cm long kind of coaming. This is necessary to ensure standing height in the aft cabin and may be the only detail that people might find odd. I was reminded of the old Swans by this. Cockpit in the Wauquiez is sufficient. Note the entrance to the salon. The cockpit is sufficiently sized. I liked the cockpit table with two folding desktops. Again, stainless steel mounting and nice lines. No mass market stuff here. The Wauquiez sets the bar higher. Of course, the available space in the cockpit and also behind the steering wheels is not that big – a tribute to the huge volume inside. 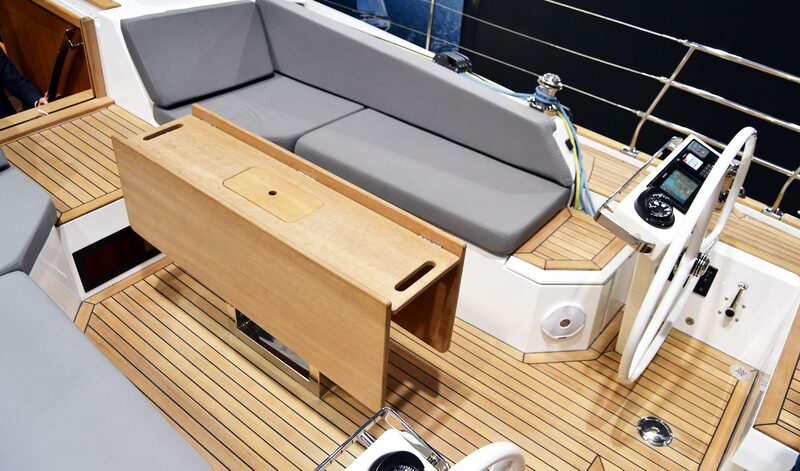 In this matter, Wauquiez follows the path of other classic owner-building brands like Hallberg-Rassy or Najad: A secure, snug cockpit without too much open space. Steering post with sheet lockers and Andersen winches. I would love to sail the Wauquiez Pilot Saloon 42 as I am interested in judging her sailing abilities in comparison to more performance-oriented boats like the Beneteau Oceanis 46.1 – is her moderate displacement hull slower? Less responsive? Is it really noticeable that a stringently V-shaped hull is more comfortable especially upwind in higher seas? I have the greatest respect for French boat building, so this would be an interesting experiment. A true Revelation in 42-feet boating! In the end I lave the Wauquiez 42 PS and I am so much in love. For me – again – this yacht is currently the most desirable long-range yacht under 45 feet. She is done in perfect craftsmanship and I couldn´t spot any quirks. 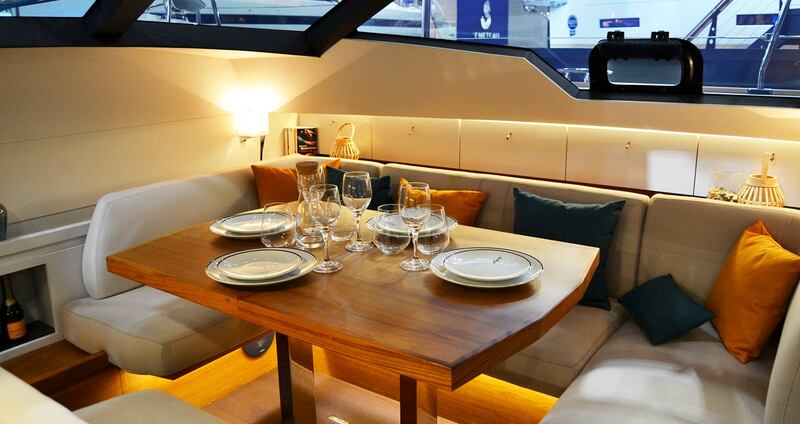 The boat offers very large volume, a great deal of luxury and yet practicality. It will be a bliss being down there cooking, eating or working, she is a beauty to be looking at and is certainly standing out from the crowd at the pontoon. I found it amazing to see what can be done with 42 feet. Of course, she is not a boat for the majority of the market which is seeking wide, open, sunny-weather maritime chillout zones with high performance, but she will find her owners I am sure and she will perform just nicely when sailed on a great loop. Well done, Wauquiez, Chapeau! At the Solaris yard in Aquilea. -Does it have a washing machine and a dishwasher? you might better ask this a Wauquiez dealer. But I do indeed have a yard-visit on my schedule and latest then I can give you an answer on that questions. Dear Anders. Yes she has two showers rooms, separated from the toilet areas. The hull insulation is balsa cored. 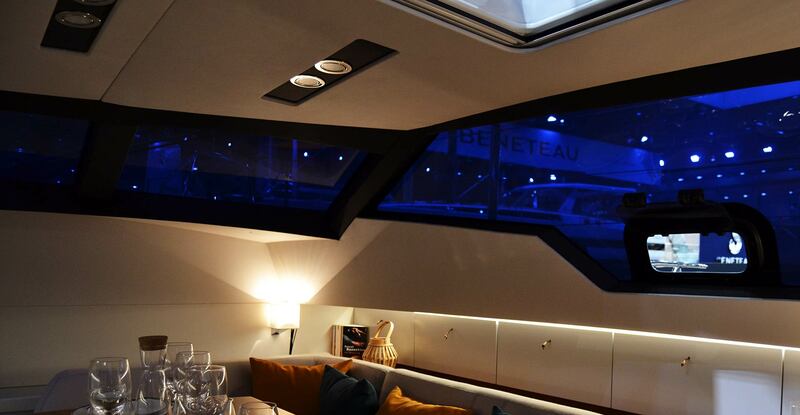 – the boat is made of advanced composite, yes it is and the windows allow not to use aircon all time. – if you want to try this challenge with only electric engine, we can do. You can have all you ask for in your questions, and the boat is built with a foam core in hull and deck. This insulate very goog, and as all inside areas are covered either with wood or foamed textile, yes she is inulated. I am your Scandinavian sales representative, see http://www.wauquiez.com. Hi Lars, very nice article. I noticed though that you said the chart table disapeared but didn’t mention the big work station aft of the galley. Previous Post	Nautor´s Swan 65 – a fresh approach to sailing?